Fortnite Season 8 has only just kicked off on all platforms, at the very end of February, and the debut week of challenges are now here. In this Fortnite Week 1 Challenges guide, we'll be going over the complete list of Season 8 Week 1 Challenges that are all live right now, so you can complete them as quickly as possible. But if you instead need any additional information on the brand new season in Battle Royale, you can head over to our complete Fortnite Season 8 guide. Here you can find an overview of the new Battle Pass, all the new character skins, and much more. 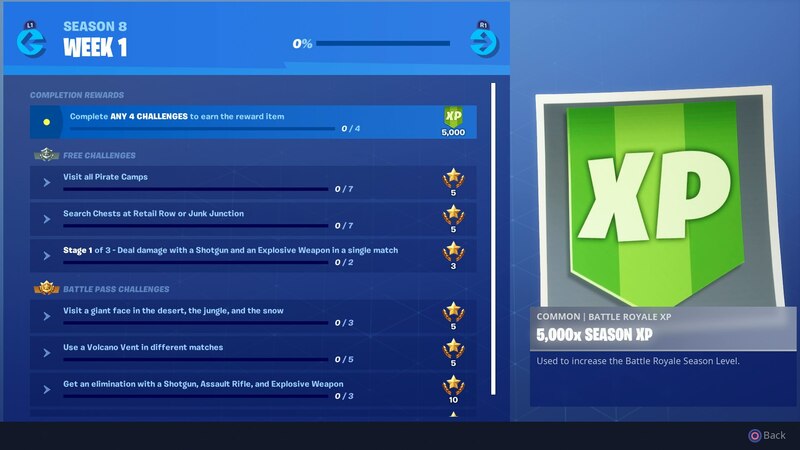 Just below, you can see a complete list of all the brand new challenges, available for all Battle Royale players right now. This slate of challenges kicks off Season 8 which, if you didn’t already know, is themed around pirates and treasure. Visit all Pirate Camps (7). Search chests at Retail Row or Junk Junction (7). Deal damage with a Shotgun and an Explosive Weapon in a single match (2). Visit a giant face in the desert, the jungle, and the snow (3). Use a Volcano Vent in different matches (5). Get an elimination with a shotgun, assault rifle, and explosive weapon (3). The debut list of challenges for Fortnite Season 8 aren't actually too tricky to complete. The only difficult one is tracking down and finding every single Pirate Camp spread around the Battle Royale map. For a complete walkthrough on how to find all 7 locations, head over to our Fortnite Pirate Camps guide. And there you have it, a complete list of all the brand new Week 1 Challenges available in Fortnite Battle Royale right now. For more information on the brand new seasonal event, head over to our Fortnite Season 8 skins guide for more. Tagged with Action,	Battle Royale,	Co-op,	Epic Games,	Guides,	PC,	PlayStation 4,	Shooters,	Strategy,	Switch,	Xbox One.